This is a celebration of the life of musical legend Donna Summer: international singing sensation and superstar. Author and dedicated admirer Nik A Ramli takes us from Donna’s early days singing in church choirs to the peak of her career in the 1970s - when 'Love To Love You Baby’ and ‘Hot Stuff’ changed the way music was made - and describes how her musical output constantly evolved in the years that followed. The book features interviews with other famous names from the industry including Gloria Gaynor, Paul Gambaccini and Pete Waterman, plus the input of an international selection of fans and musicians. 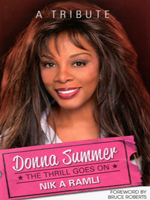 There were ups and downs for Donna Summer, personally and professionally, but her outstanding talent and unique voice never faltered and she continued to produce work that will live on for years to come; her tracks are frequently covered, sampled and used for film and TV soundtracks. Her tragic death at the age of 63 shocked fans eagerly awaiting news of her next album. Nik A Ramli’s account of Donna Summer’s sensational career proves that she was indeed a truly versatile and inspirational singer and songwriter, not only the Queen Of Disco!